The upcoming May election is past approaching. 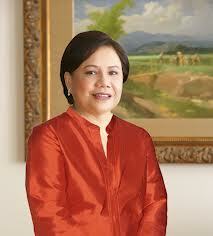 And one of the senatoriables that I’ve admire is former Las Pinas Congresswoman Cynthia Villar. As we all know, she is the wife of Senator Manny Villar, and blessed with three children: Paolo, Mark and Camille. • Completed her Masters in Business Administration at the New York University. • Her political blood runs in the family. Her father, Dr. Filemon Aguilar, who was mayor of Las Piñas and also a congressman from the Lone District at one time. Her brother, Vergel Aguilar (Nene Aguilar) the mayor of Las Piñas for the fifth term. • President of the Lady Legislators of the House of Representatives during the 12th, 13th & 14th Congress of the Philippines—during her term, landmark bills upholding the welfare of women, children and families were passed. These include the Magna Carta of Women, anti-trafficking of women and children; anti-violence against women; protection of children in the workplace; juvenile justice system; the two versions of the Senior Citizens Act (2003 and 2010); among many more. • During her term as chairperson of the Congressional Spouses Foundation from 1998 to 2000, built 11 regional centers for women who are victims of abuse. • During her term as president of the Senate Spouses Foundation, Inc., from August 2006 to December 2008, the Foundation raised P25 million for the rehabilitation of eight charity wards at the Philippine General Hospital (PGH). • Her Sagip-Ilog program, the Las Piñas River Rehabilitation Project, won the United Nations (UN) Best Water Management Practices Award in celebration of the Water for Life Decade held in Zaragosa, Spain on March 2011—beating contestants from 38 countries. There is a hibiscus flower (gumamela) named after Mrs. Villar. The University of the Philippines Los Baños included her in an exclusive list of distinguished women honored by UPLB with their own hibiscus flower. She received a unique flower that bears her name in 2011, the ‘Hibiscus rosa-sinensis Cynthia A. Villar,’ The ‘Hibiscus rosa-sinensis Cynthia A. Villar’ has dark orange petals which evoke the color mainly associated with Cynthia and her husband, Senator Manny Villar. The flower has a red eye and pinkish halo and is the latest hibiscus hybrid to become part of the Women in Public Service Series. Villar was recognized for her invaluable contributions to her home city and country as a legislator, a successful entrepreneur, leader, environmental advocate, and exemplary public citizen. The establishment of the Villar Social Institute for Poverty Alleviation and Governance or SIPAG, which will serve as the center of all her efforts and endeavors in reducing poverty in the country. It is where individuals, organizations, local government units (LGUs) and non-government organizations (NGOs) can go for research, training and related events. R.A. No. 9175, Chain Saw Act of 2002 spearheaded the raising of P25M for the rehabilitation of Philippine General Hospital charity wards, as president of Senate Spouses Foundation, Inc., Aug 2006 to Dec 2008. UP Distinguished Alumna Awardee in 2004. Awards for Las Piñas-Zapote River System Rehabilitation “Sagip Ilog” Program: United Nations Best Water Management Practices Awardee (among 38 entries) in celebration of the Water for Life Decade held in Zaragoza, Spain in March 2011, Best Practices Awardee for Outstanding Contribution Towards Improving the Living Environment from UN Human Settlements Program, Dubai International Awardee, OIKOS Global Case Writing Competition for the Sustainable Livelihood Program developed out of river wastes and International Green Apple Awardee for Environmental Best Practice. Back to the 80s Concert Party featuring Modern English and The Alarm LIVE in Manila!